When I went, only 2-3 restaurants were opened and I settled for “Big Fish Small Fish.” And their computers weren’t working. Haha. BFSF reminds me of the fish and chips shops in Australia. You select the type of fish, from the cheapest dory ($6.90) to the most expensive, fresh red snapper ($15.90). 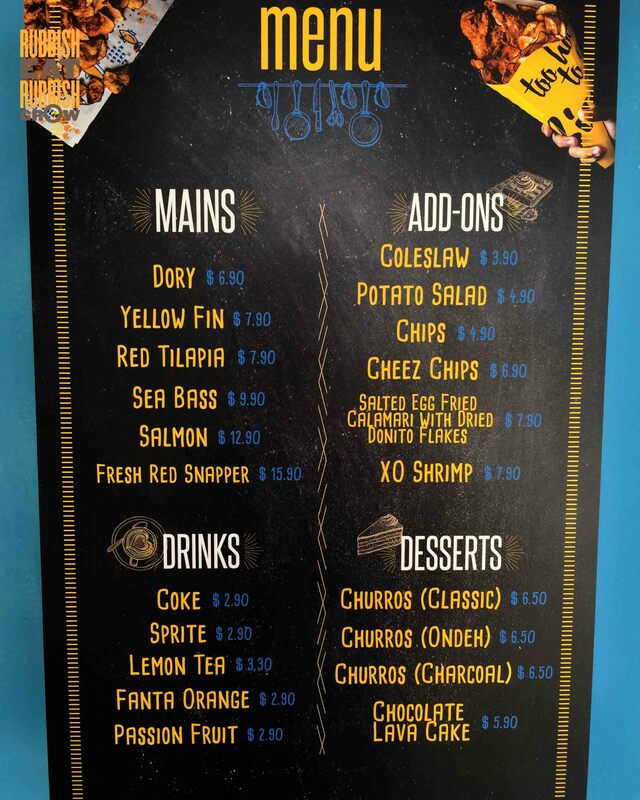 The fish comes with chips. You have a choice of tartar sauce, or mozzarella cheese dip (that stretches), or homemade XO mayo (basically something like Lee Kum Kee XO sauce + mayo). I ordered one of my favorite fish, sea bass ($9.90), and it is delicious. The crust is thin and crispy, the fish is fresh and moist. I appreciate that they slice potatoes freshly to make the chips (not the supermarket pre-packed type with lots of chemicals) but some of the slices are not crispy. The spicy XO sauce adds a bit of excitement to the fish. It’s very cute that they have holes in the table you can put your fish and chips or paper cups. Speaking about drinks, they don’t serve free water, which is a demerit point for them. Speaking about demerit points, the fish serving is small. Besides fish and chips, they also have sides like coleslaw ($3.90), potato salad ($4.90), xo shrimp ($7.90). I ordered the salted egg calamari with bonito flakes ($7.90). The bonito flakes add a nice dimension but I can’t really taste the salted egg yolk and the squid is too tough. I chewed on a piece which was more durable than diamond; it was unbreakable. For desserts, they have churros and I got the ondeh churros ($6.50). It doesn’t have the ondeh ondeh taste. Perhaps they should roll the churros over some dry coconut flakes and gula melaka sugar. Next time, I’ll stick to the fish and chips, which is pretty decent, and maybe get a coleslaw. I was alone and paid $27 but there is food enough for 2 persons. Do you know Punggol East Park? Or Tebing Lane? It is where Popeyes is. The row of cargo containers are just beside Popeyes. If you’re driving, no problem, just turn into Tebing Lane. If you’re taking LRT, there is a shortcut. Drop off at Riviera LRT. Just beside the tiny stadium, there is a drain. Walk straight down and you’ll reach the containers in 2-3 minutes.